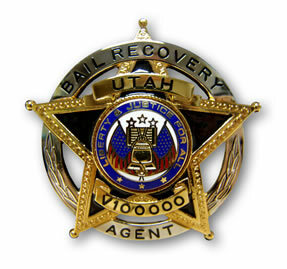 (vii) the badge must contain two gold panels with writing to indicate the word “Utah” on the top panel and the agent’s license number on the bottom panel. 53-11-121. False representation as a licensee — Badge — Identifying clothing. (1) A licensee under this chapter may not wear a uniform, or use a title or identification card other than the one issued under this chapter, or make any statement that would lead a reasonable person to believe the licensee is connected in any way with the federal government or any state or local governmental entity, unless the licensee has received authorization in writing by one of those governmental authorities to do so. (2) A licensee may possess a badge of a design approved by the board for use by a licensee. (3) The licensee shall wear the badge under Subsection (2) in a manner that prevents the accidental or inadvertent display of the badge to persons in the presence of the licensee. 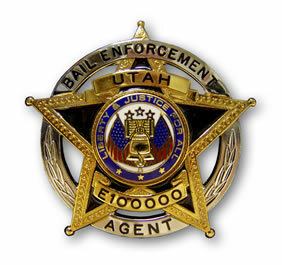 (e) the licensee is acting as a bail enforcement agent but is not engaged in a planned apprehension or in another situation that does not require that the agent be wearing clothing as described in Subsection (4)(a) or (5) in order to display the badge. (b) is approved by the board. (6) When a licensee is acting as a bail enforcement agent and interacts with a law enforcement officer, the licensee shall, at the first opportunity, identify him or herself to the law enforcement officer and shall provide identification as a bail enforcement agent.